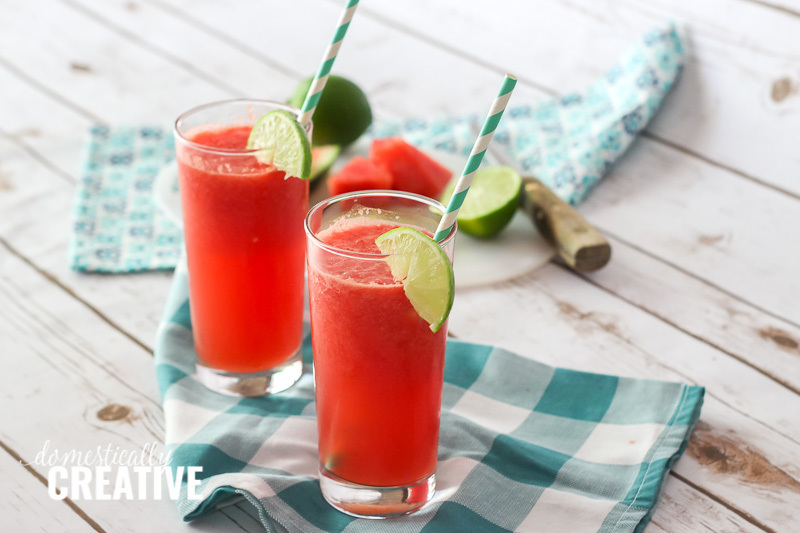 An easy, refreshing Watermelon Lime Spritzer drink to help beat the summer heat. Simple ingredients you can put together in minutes to create a delicious Summer drink recipe. 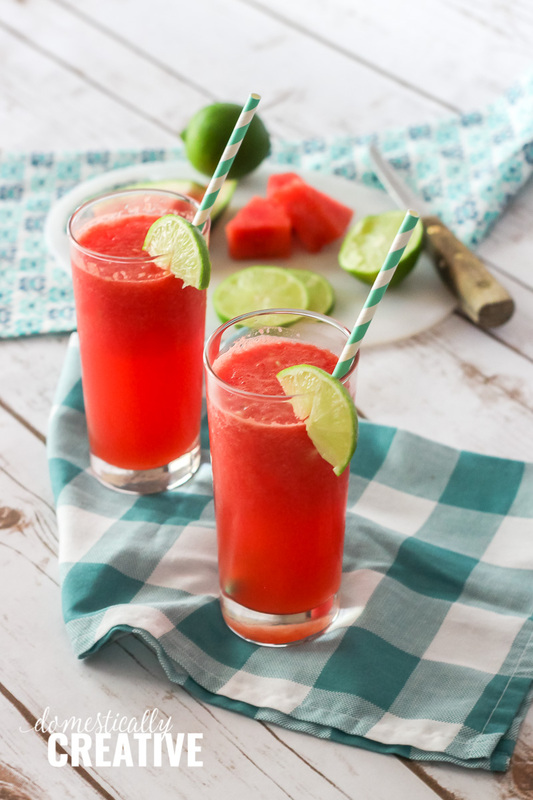 This Watermelon Lime Spritzer drink recipe was originally written in 2014. I’ve since updated the photos and recipe card a bit, but left the rest of the story intact! On Tuesday, hubby and I decided to take a trip to a neighboring town, called Bastrop. We putzed around in the historical downtown district, which was really neat. A lot of the old buildings were restored, without losing that sweet original charm, and turned into varying businesses. There was even a little walking area and park along the Colorado River, which we went down, despite it being 108 degrees outside. We visited a few farmer’s markets while we were there too. While most of the markets are dwindling down, getting ready for their fall/winter crops, we still scored some okra, cucumbers and a big juicy watermelon. The lady we bought the watermelon from told us how she used some of the leftover watermelons she had to make 4 GALLONS of juice. I guess I never really thought about turning watermelon into “juice”, but I was intrigued. She was super friendly, and even gave us a recipe for pickled watermelon rind. We were both so perplexed by the concept of pickled watermelon rind! Now, don’t get me wrong, I LOVE pickles, and my hubby loves pickled eggs. I have even eaten pickled fish before, but pickled watermelon rind sounded pretty unappealing. Being the sweet lady she was though, she busted open a jar she had and let us both try it. Hey, I’ll try anything once! I’ll admit it wasn’t the worst thing I’ve tasted, but it reminded me of old fashioned clove candy. You know the kind I’m talking about. The kind that you can smell and even taste the clove about a mile away! The texture was a little different, not bad, but man was the clove and ginger overpowering. I guess if clove is your thing, you might want to give pickled watermelon rind a try! So back to the point of my story. We ended up going home with a HUGE watermelon. I mean this baby was giant! There was no way we would be able to eat all of it so I decided to try out the whole “juicing” idea. It was pretty easy to make! All you do is take your cubed and seeded watermelon and mix it up in your blender (a food processor may work if you don’t have a blender). Since watermelon is mostly water, you don’t need to add any liquid to it. The watermelon “juice” was just fine by itself, but I got to thinking that maybe I could make a refreshing summer drink recipe too. I had some limes, a little bit of simple syrup left over from another recipe, and some club soda. I combined all of those things and came up with a this Watermelon Lime Spritzer. It’s perfect for cooling off from the summer heat! 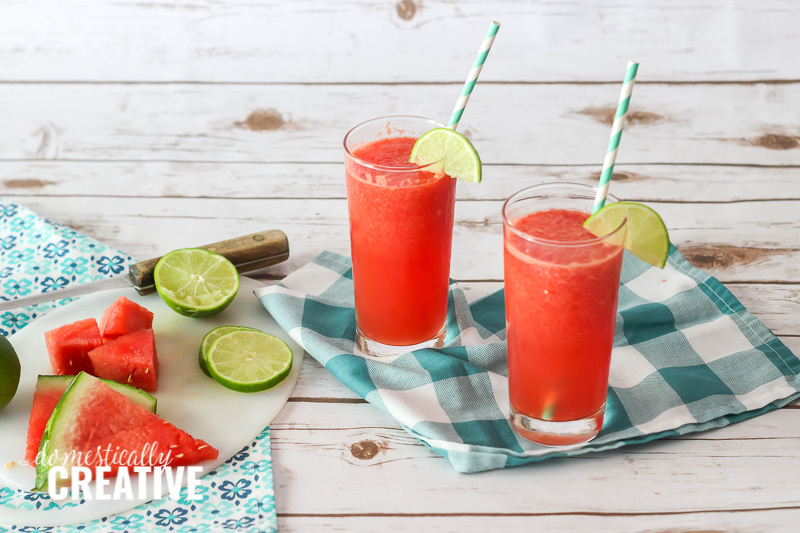 This watermelon lime spritzer drink recipe was pretty easy to put together too. I just used the juice from 2 limes and mixed it with the “juiced” watermelon. I added a bit of club soda and a splash of simple syrup and it was perfect! 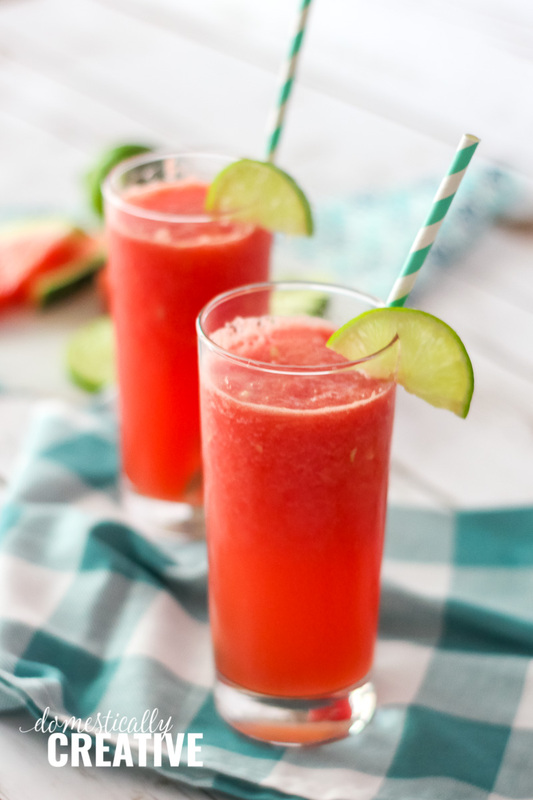 Easy, refreshing Watermelon Lime Spritzer! An easy, refreshing, drink to help you beat the summer heat. 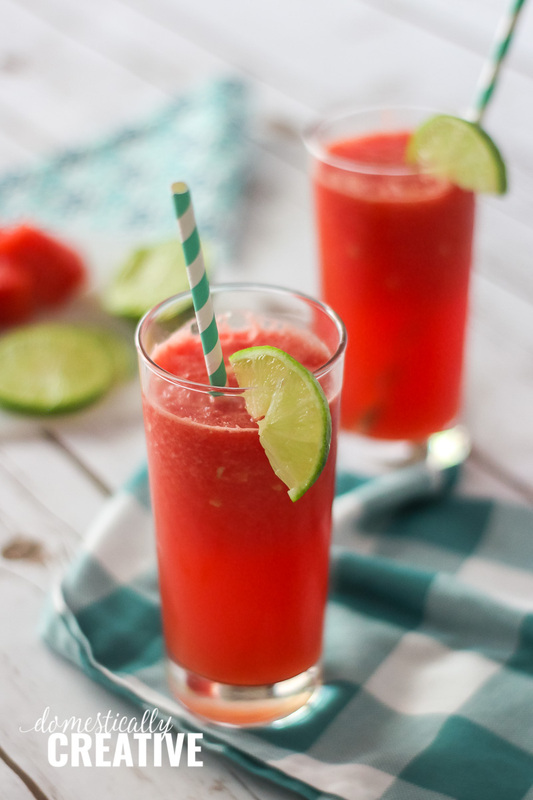 Puree cubed watermelon in a blender. Add in juice from limes and pulse a few times to mix. 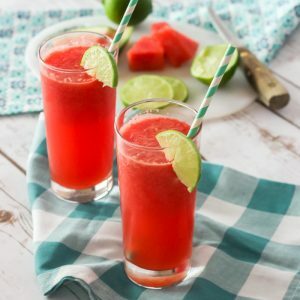 Pour watermelon lime juice into a glass 1/2-3/4 way full. Add in splash or two of club soda, and simple syrup to taste. Mix well, and garnish with lime slice. Hello, my name is Misty, from The LadyPrefers2Save at and I’m one of the new co-hosts for the Merry Monday Linky Party! I am just stopping by to introduce myself, and to let you know how awesome your blog is! Hi Misty! It’s nice to meet you and I’m excited to be Co-Hosting with such a great group! This sounds so yummy! 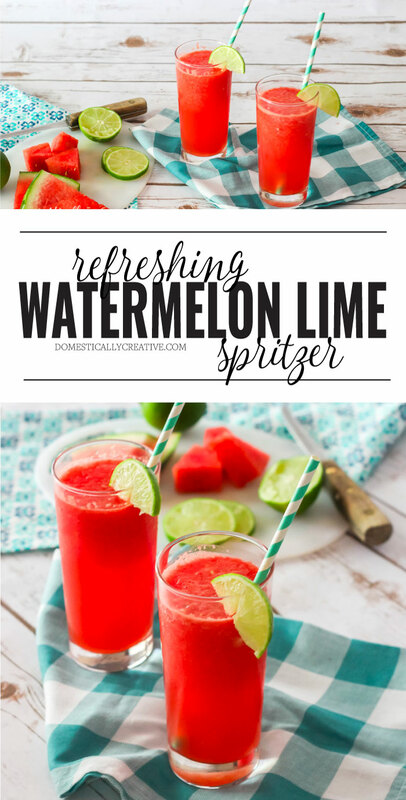 What a great way to enjoy watermelon for a little bit longer at the end of the season.Pinning. This is an easy way to cool down! I’m ready for fall, but I don’t know about winter yet!! It’s so nice to have a lovely fresh summer drink like this that everyone can enjoy. Your Watermelon Lime Spritzer looks really elegant and so refreshing. I’ve never tried watermelon rind pickles, but I definitely want to try this. Featuring this post at the Hearth and Soul Link Party this week. Thank you so much for sharing it. Have a great week and hope to see you at the party!